June 29, 2016 at 8:33 pm EDT | by Lou Chibbaro Jr.
More than 20 Delaware elected officials and candidates for public office, including Gov. 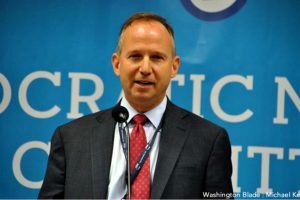 Jack Markell, joined 75 mostly LGBT Democrats in Rehoboth Beach on June 25 for the 13th annual summer fundraising event of the Barbara Gittings Delaware Stonewall Democrats. Markell was one of three people honored by the organization for his longstanding support for LGBT equality as he nears completion of his second term as governor. Under a state term limits law he cannot run for a third term. 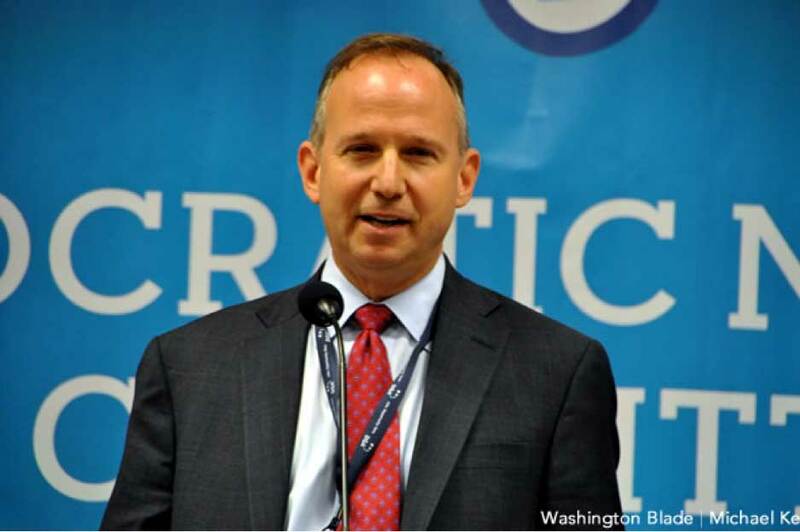 “It was a great event because it really gave an opportunity for us to reflect on the progress we’ve made in seven years,” Markell told the Washington Blade this week in an interview. Markell attributed his ability to help bring about those changes to the committed advocates associated with the Delaware Stonewall Democrats and other LGBT advocacy groups. “And so although I’m the one who gets to take the very nice plaque home – the LGBT Hero Award – the truth is the real heroes are those in the community who keep fighting,” he said. Peter Schott, the immediate past president of Delaware Stonewall Democrats, said the group’s annual summer fundraising event, held this year at Mariachi’s Restaurant in downtown Rehoboth, is typically attended by Democratic elected officials and Democratic candidates running for public office from all sections of the state, including Wilmington and Dover. “This has always been a big statewide event,” he said. Others who attended this year were U.S. Rep. John Carney (D-Del. ), who is running for governor; State Rep. Pete Schwartzkopf, who serves as speaker of the Delaware State House and represents the Rehoboth Beach area; and Lisa Blunt Rochester, the state’s former Secretary of Labor who is one of three candidates running for Carney’s congressional seat. Also attending were Sussex County Clerk of the Peace John Brady, who’s gay; and Delawarean and former Stonewall Democrats board member Anthony “Roddy” Flynn, who currently serves as executive director of the bipartisan LGBT Equality Caucus of the U.S. Congress in Washington. Brady and Flynn were also recipients at the event of the organization’s LGBT Hero Award. Schott said Stonewall Democrats members were especially appreciative of Brady, who is retiring this year. He is currently the only openly gay elected official in the state. Markell told the Blade he’s supporting Carney to succeed him as governor. Following is the complete transcript of Markell’s interview with the Washington Blade, which took place Tuesday, June 28. Washington Blade: What are your thoughts on how the Delaware Stonewall Democrats event went on June 25? Can you tell a little about what you said there? Gov. Jack Markell: It was a great event because it really gave an opportunity for us to reflect on the progress we’ve made in seven years. It is hard to believe that seven years ago it was legal in Delaware to discriminate on the basis of sexual orientation. And not only did we change that, not only did we pass civil unions and then passed marriage equality — and then we passed protection based on gender identity as well. And so we’ve made enormous progress in seven years and which is something we can all be proud of. But I think the other perhaps even more important point is that that progress was only possible because we had a group of very dedicated advocates. And you know it’s fine for people like me to be willing to make these changes. But the truth is without advocates who lobby and who keep up the fight, these things don’t happen. And so although I’m the one who gets to take the very nice plaque home – the LGBT Hero Award – the truth is the real heroes are those in the community who keep fighting. Blade: Do you see anything else that might be next? You will be governor through the end of this year, right? Markell: In terms of law, I don’t know that we have a lot of changes still to make. But I think yeah it’s about being a welcoming and embracing community. And part of our thrust from the beginning – we’ve been so focused on the economy. And one of the most important things for building a strong economy is to be inclusive because the truth is the kinds of employers who we want to grow in Delaware care most about recruiting and keeping great talent. And great talent comes from many different backgrounds. And employers don’t care if their talent is white or black or Hispanic or Asian. They also don’t care if their talent is straight or gay. And as a result, we need to make sure that we have a very nurturing, welcoming community and environment and set of laws and regulations so that everybody feels welcome here. That’s how you build a 21st Century economy. And I think in that way the fight is never over because you want to make sure that you continue to push the culture. Blade: There were quite a number of state elected officials who attended the Stonewall Democrats event in addition to you. A number of Democratic candidates for public office attended as well as public office holders. Does that say something that so many public officials would go to an event by an LGBT Democratic organization? Markell: You know I think that it does. And I think the truth is we’ve had a great crowd of elected officials and candidates at that event for years now. And I think the LGBT movement has more than arrived in Delaware. It is fully part and parcel of our Democratic Party. And for that matter, some on the other side as well. This was a Democratic event. It was the Stonewall Democrats. But the folks in the LGBT community – you can’t talk about our party without acknowledging the incredibly important and powerful role that many in the LGBT community play in our party. Blade: You are term limited so you can’t run again for governor. But are you backing anyone to succeed you? Markell: I am backing [U.S. Rep.] John Carney, who I think will be a great governor. He was at the event on Saturday. And he’s somebody who gets it. And I think he’ll be in a great position to help the state build on the progress that we’ve made over the last eight years. Blade: Peter Schott, the immediate past president of the Stonewall Democrats, expressed concern that Republican State Sen. Ernesto Lopez, who represents the Rehoboth Beach area, voted against a proposed state constitutional amendment with non-discrimination language in it. Do you see that as having some chance of passing? Markell: You know, because it’s a constitutional convention it has to pass by a certain majority of the General Assembly – I think in two consecutive General Assemblies. And since the governor is actually not a party to that I have just not paid as much attention to it. But I do think it’s a generational issue. And if it doesn’t pass this time it will pass because that’s just the nature of our state and our country becoming more accepting and more embracing of the LGBT community. Our Club took its name from the Stonewall Inn where nearly half century ago, long hassled members of the LGBT community resisted the continual harassment by the New York City Police. Dedicating the Inn as a National Monument is a symbolic reminder of how far we have come as a community in that length of time, to a point where our National Government finally recognizes our worth as human beings. But we also are reminded that in not every corner of our Nation, and certainly in many parts of the world, we are still being denigrated and murdered. We thank our President and the National Park Service for the dedication, but we pledge that as a Club, we at Barbara Gittings Delaware Stonewall will continue the fight to attain full rights for all oppressed persons. One day after providing a front page photo op by attending a vigil in the CAMP Rehoboth Courtyard in solidarity with the Orlando LGBT Community, Republican State Senator Ernesto Lopez, who represents the Lewes/Rehoboth Beach area, refused to support a proposed State Constitutional Amendment which would have added an equal protection clause to the Delaware Constitution which barred discrimination to a number of protected classes, including the LGBT community. Senator Lopez’s decision to side with all but one Republican meant that the Amendment was one vote short of the two/thirds needed for passage so sponsor Senator Karen Peterson withdrew the Amendment. Lopez argued that since current law provides protection a Constitutional Amendment was unnecessary. However, current law could be overturned by a simple majority of votes by the Legislature, while a change to the Constitution would involve a much more difficult effort to undo. Lopez criticized the vote as being too soon after the tragedy at Orlando, asking for a cooling down period to reflect. The tragedy in Orlando proves that the time for reflection has long passed and the time for action is now. Orlando proved once again that the LGBT community is a target for hate and that we need equal protection laws now. Although he ran twice as a friend to the LGBT community, Lopez also voted against Marriage Equality and Gender Equality when those bills were considered by the Legislature. Is he a true friend? Lopez’s vote with the majority of Republicans shows why it is so important for groups such as the Barbara Gittings Delaware Stonewall Democrats to exist. With your support we will continue to fight for you, without you our efforts become less effective. Governor Markell signed into law Gender Identity protections on June 19, 2013. A Statute creates standards and rules. An administrative agency is empowered with advertising and adopting Regulations which set out a process of monitoring and enforcing a statute. Regulations have the force of law. Instead of promulgating a regulation, Commissioner Karen Weldon Stewart issued a Bulletin. A Bulletin is merely a statement of what the administrative agency believes the law requires. It is not enforceable. It does not create a method for insurers to report compliance with the law. In reality it will not help Delaware policy holders seeking medical treatment. A possibly even greater concern is the Department of Insurance regulates only health insurance policies issued in Delaware. The DOI does not regulate individuals whose employers are self-insured. As an example, the State of Delaware is self-insured. Even a well-meaning Bulletin does not govern, and the DOI cannot require, that the State of Delaware provide coverage for its employees (including teachers and law enforcement officers who are covered by the State Plan). The only vehicle for providing such coverage for state employees is adding that coverage to the state plan. Such an addition must be made by the State Benefits Committee. Commissioner Stewart is a voting member of that committee. The BGDSD asks Commissioner Stewart why she has not proposed that state employees be covered if she truly believes that transgender Delawareans should have insurance that pays for transition-related medical care? Our 13th annual summer fundraiser, at Mariachi’s Restaurant in Rehoboth Beach is scheduled for June 25 beginning at 2pm. Most of the State’s elected officials and candidates will be present. The money we raise from this event is used to elect LGBT-supportive candidates, so please sign up to buy a ticket or become a sponsor. Sponsorship benefits are listed on our website. We are pleased to announce that one of our honorees this year is Anthony “Roddy” Flynn, a Delawarean who is Executive Director of the very important LGBT Equality Caucus of the US Congress. Roddy is sure to update us on some of the National issues which his Caucus is pushing. The Delaware Insurance office has issued a bulletin instructing health insurance companies operating in Delaware that they must cover transgender surgical procedures. Delaware is the 15th State to do this. Barbara Gittings Delaware Stonewall Democrats applauds this decision and will fight efforts by members of the State legislature to overturn this directive. Ever since its inception in 2003, Barbara Gittings Delaware Stonewall Democrats has been in the forefront of endorsing pro-equality Democrats. It is because of our efforts that we were able to move forward with legislation which gave us non-discrimination, marriage equality and transgender rights. I am very honored to have been appointed as Acting President of Barbara Gittings Delaware Stonewall Democrats, as our current President, Joe Daigle, steps down to pursue a seat in the Delaware House of Representatives for the 7th District. As a founder of the organization, I can say I am very proud of how far we have come in thirteen years, but I am concerned about the future of the organization, and so I approach this task with some trepidation. We cannot rest on our laurels and must continue to move forward to assure that the rights of the LGBT community not be diminished or compromised.